Seagal the hoarse whisperer is still in the movie game, for some reason. He should’ve been red-carded a decade ago, abandoning anything resembling fluid movement for eons with respect to martial arts. In Deadly Crossing, Steven is Elijah Kane, and the ethnically ambiguous aikido master is apparently a Cajun Seattle cop. It’s a reprise of the Cajun accent he started and then abandoned midway through 2005’s dud Submerged which we discussed on our Really Awful Movies podcast devoted to some latter day films featuring Lord Steven. 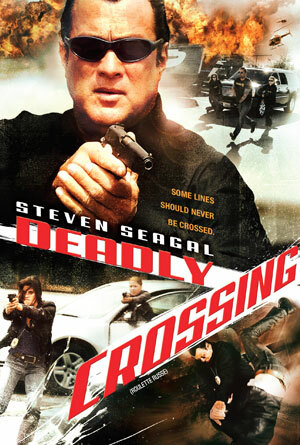 Deadly Crossing, which sounds like a dangerous intersection for pedestrians due to poor signage, was actually spliced together from a limited-release TV show True Justice: Deadly Crossing that aired on ReelzChannel (is that for realz?). And it’s pretty police procedural stuff. Kane is breaking up the local heroin scene and going after Russian baddies as part of an elite police special task force, because as we all know very well, Seagal is a special forces op in about oh, 75% of all his films. When two Chinese-American shopkeepers are gunned down and their daughter is found cowering in the bushes, our man Steve drops a bit of Mandarin before calling for a translator. The trail leads to a trailer park and a gangster named Domion, a guy “so bad he makes onions cry.” Where’s a re-animated Muhammad Ali when you need him? Seagal’s new recruit, a hot blonde, and a hot brunette, go undercover at a local strip joint to try and glean info from a gangster improbably named Nikolai Putin and improbably accented by Gil Bellows (Shawshank Redemption), whose performance is beyond redemption. At one point Seagal murmurs, “immigrants are my kinda people,” which prompts the question, what kind of person, ethnically-speaking, is Steven? Maybe it’s Hungarian as he is sporting a utility scrub brush version of Bela Lugosi’s “V” hairdo from White Zombie. And corn this is. Bland, and despite this being Seattle, nary a Starbucks in sight to provide a jolt. There’s also a warehouse shootout. Because, what action movie is complete without a warehouse shoot-out? This entry was posted in Action Films and tagged action stars, horror podcast by Really Awful Movies. Bookmark the permalink.